It is an interactive experience that incorporates not one but two exhibitions: Jemima Wyman: Pattern Bandits, a Queensland Art Gallery | Gallery of Modern Art (QAGOMA) Touring Exhibition, and Patterns in Nature, an exhibition based on TMAG's own collections. From thousands of colourful beetles and spotted quolls, to spinning mandalas and kaleidoscopes of colour, there is something to enthral visitors of all ages. Jemima Wyman: Pattern Bandits is a visually spectacular and hands-on exhibition that explores patterns in art, examining the transformative and immersive qualities of camouflage, kaleidoscopes and other patterns. It encourages young and old alike to interact with pattern and pattern making as a form of self-expression and identity, and allows them to take home their own artistic creations. Patterns in Nature highlights the many amazing patterns that occur in the natural world, including the spots, stripes and spirals that form the patterns we see every day. It uses items from TMAG's much-loved science collections, as well as interactive elements, to engage visitors with the patterns that occur in nature, with particular reference to Tasmanian plants and animals. Pattern Play will be accompanied by a rich public program of events and activities, including the Spots, Stripes, Spirals museum trail, an expanded January School Holiday Program, monthly pattern-themed Family Days, resources for teachers, education programs and a Children's Festival. Also enhancing the exhibition and greeting visitors to the museum is the immersive installation Cellular Tessellation in the TMAG Courtyard, which was originally created for Sydney's Vivid festival. As Pattern Play is opening just before the busy summer holiday season, the museum will also be open on Monday 28 December so families checking out the festivities on the Hobart Waterfront can also visit the exhibition. TMAG has been able to join forces with a range of partners and sponsors to make Pattern Play possible, including major partners TasNetworks and Detached Cultural Foundation, education sponsor Nyrstar and program sponsor the Foundation of TMAG. Pattern Play is on show at the Tasmanian Museum and Art Gallery from 18 December 2015 until 15 May 2016. The museum is open Tuesday to Sunday from 10:00 am – 4:00 pm. To coincide with the exhibition, TMAG will also be open on Monday 28 December from 10:00 am – 4:00 pm. For more information, visit www.tmag.tas.gov.au/patternplay. 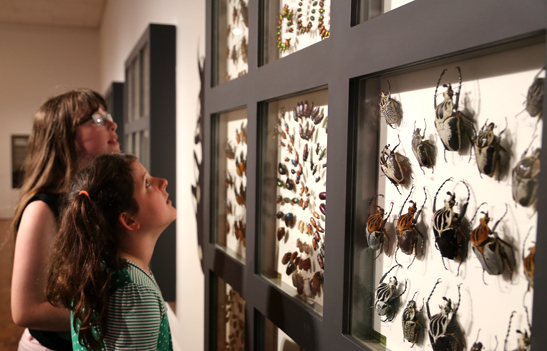 Image details: (top) Young visitors viewing the Bornemissza's Forest Beauties of the Beetle World display in Patterns in Nature. 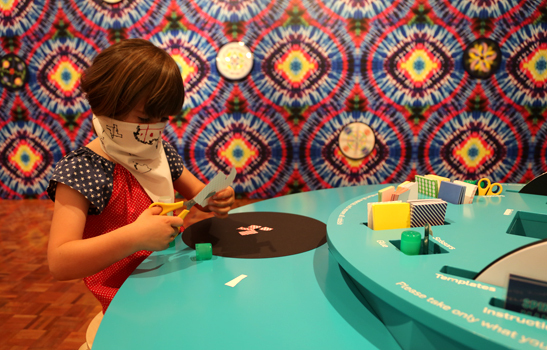 (middle) A young visitor creates a mandala to place on the Spinning Mandala Portal Wall in Jemima Wyman: Pattern Bandits.